A high-speed rail line between the two areas has been discussed since the 1970s. XpressWest was the most recent iteration of an idea that makes sense on so many levels, but hasn’t been able to get to the construction phase. Last week, Brightline, a privately owned and operated intercity passenger rail system serving South Florida, acquired XpressWest — the private venture proposal to build a high-speed rail line between Las Vegas and Southern California. Four decades? Really? High-speed rail between Southern California and Las Vegas began as a potential testing ground for what once was new technology, magnetic levitation, or maglev. The concept, used in Asia and Europe, is to propel a vehicle at high speeds on a magnetically charged frictionless guideway. Why did maglev fail? It was going to cost too much to build. As the technology emerged, the price came down, but by the time it reached a tolerable level, policymakers had moved on to conventional rail solutions. What is XpressWest? Once known as DesertXpress, it is a company headed by resort builder Anthony Marnell. It developed a project to build a conventional high-speed rail line 185 miles from Victorville, California, to Las Vegas. Why Victorville? The high-desert community was identified as a location where virtually all traffic to Las Vegas on Interstate 15 would eventually pass. Why would people drive to Victorville to get on a train to Las Vegas? That’s the question that has dogged XpressWest from the beginning and what skeptics continue to ask. The company says its research indicates there would be enough riders from Southern California willing to buy tickets to make the venture financially viable. Why did the XpressWest plan fail? It was undercapitalized and there weren’t enough investors to pay for the approximately $7 billion in infrastructure costs. Costs went up when developers suggested adding more track between Victorville and Palmdale, California, where the line would intersect with the Los Angeles Metrolink commuter rail and the eventual California High-Speed Train system. Presidents Obama and Trump championed transportation infrastructure projects but when XpressWest went for a federal loan within the Federal Railroad Administration’s Railroad Rehabilitation and Improvement Financing loan program, it was shot down by two Republican lawmakers, Rep. Paul Ryan and former Sen. Jeff Sessions. What was the reasoning? XpressWest was going to be supplied by Bombardier, a Canadian company. The loan program has “Buy American” loan provisions. But there was also widespread skepticism that the plan would fail and the financial burden would fall to taxpayers. What would Brightline do differently? Company spokespeople say they can reduce the project’s cost through efficiencies developed through its Florida project. It’s also supplied by “Buy American”-compliant Siemens USA. How much will tickets cost? XpressWest promoted an average price of $89 round trip. Brightline offers tickets as low as $20 one way on some of its routes. Will Nevada laborers, already fairly stretched on construction projects in Southern Nevada, build the Nevada portions of the railway? Where will a Las Vegas intermodal train station Brightline announced be built? Would Brightline consider an “auto train,” similar to what Amtrak offers between Washington D.C. and Orlando so that people can have access to their vehicles in Las Vegas and Southern California? 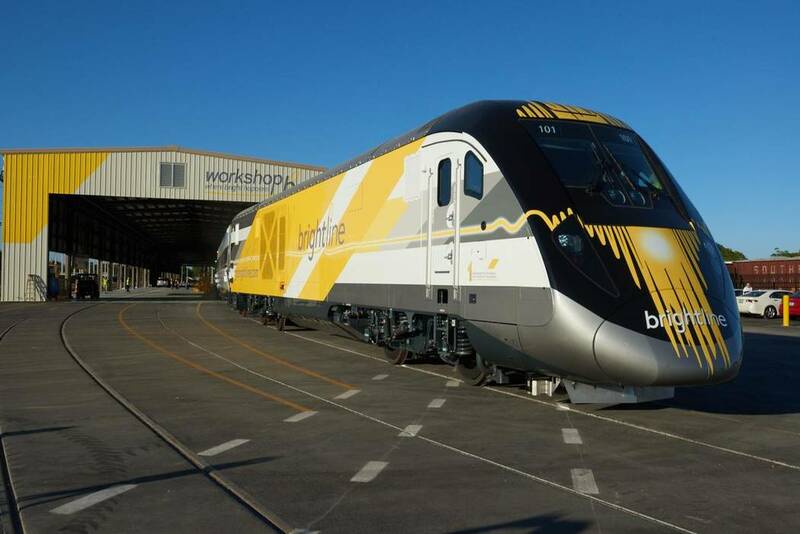 The fact that Brighline has managed high speed rail project before — it began operating a high-speed train route between Miami and West Palm Beach earlier this year — gives train fans new hope that XpressWest might just happen after all.